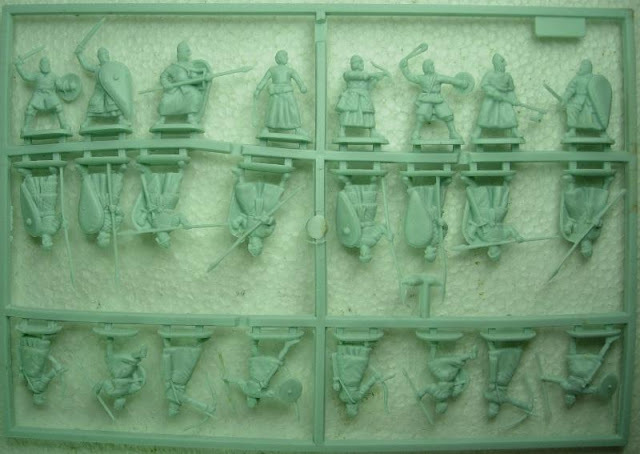 Standard HäT box, this time the quality of the drawing is quite low, it doesn't attract you very much to buy the product, and with a set with very different types of soldiers showing just one man is not a good idea. Fortunately, the figures inside are better than the box art. 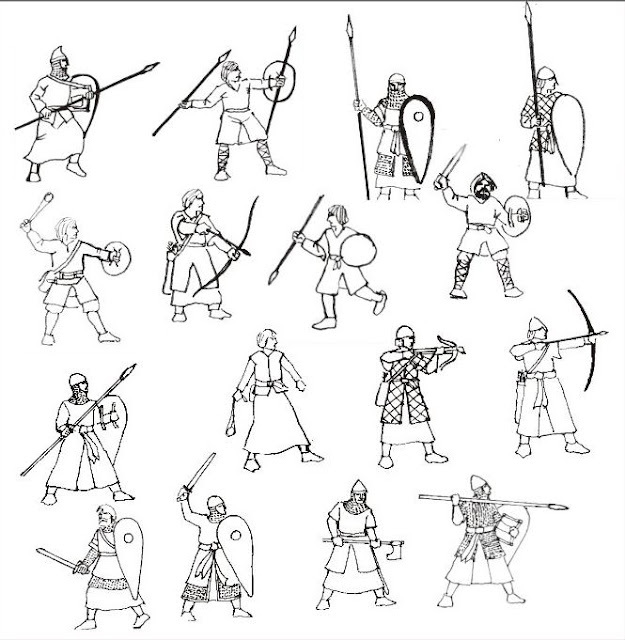 The rear of the box shows you the poses, basically drawn. I prefer the Zvezda way of showing the painted figures, as sometimes the drawings suggests better quality figures that you really get. Although the detail is not very crisp,( it is a bit faint everywhere), they are really nice figures, some of the best HäT has produced, in a style I would love to see HäT continuing to produce. HäT has the particularity of being nearly the only brand that has very distinct styles of making their figures, not just between different periods,but even in the same period and at the same time.It is not a progressive evolution, just a random selection of sculptors with very different techniques. 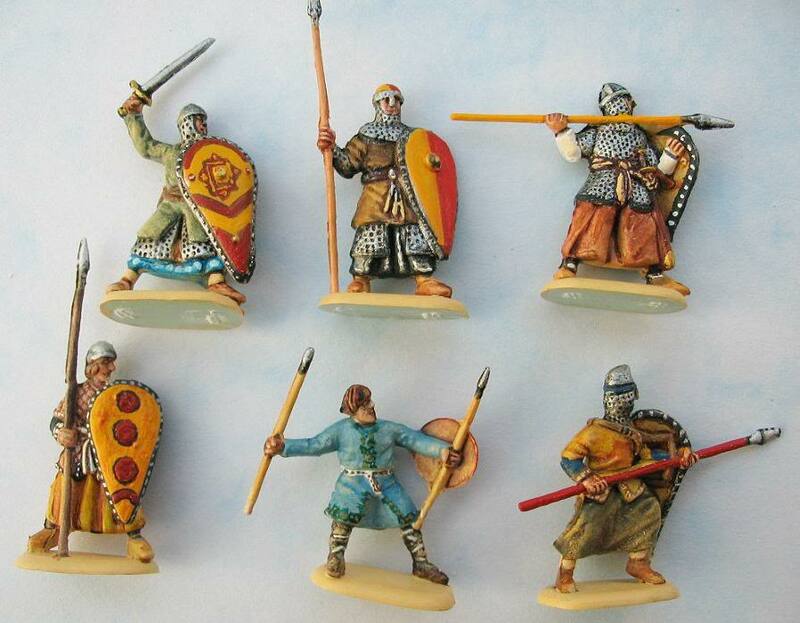 In this case, all "El Cid" miniatures have the same style. 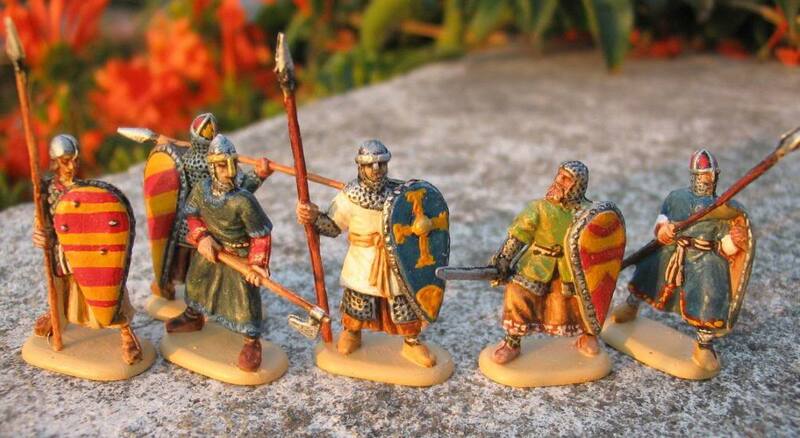 This is a style with diffuse detail, but good proportions and quite good poses. The research has been well done - I don't see any historical error. What is best, the research has been properly applied, with this set being different to other Medieval Christian sets, having a distinct "flavour" and maintaining a good balance between spearmen, swordsmen, archers, etc. 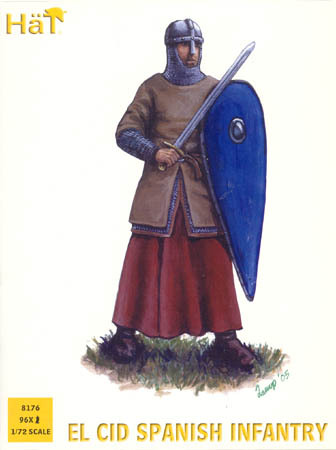 The only curious thing is that everybody is wearing full clothes and seem to be fighting in winter, as it would be hard to continue wearing such garments in summer in Castille and in the center of the peninsula, so they should be named "El Cid Spanish Infantry in winter dress". 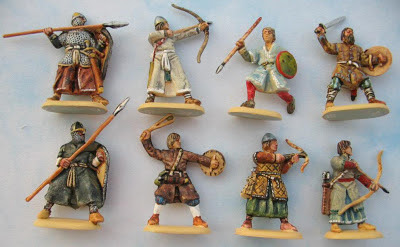 Except the slingers and the skirmishers, all these figures are perfect to represent a myriad of Middle Age factions. With their long robes, the first that comes to my mind would be doing the Medieval kingdoms of Denmark, Sweden, Poland, Hungary, etc. 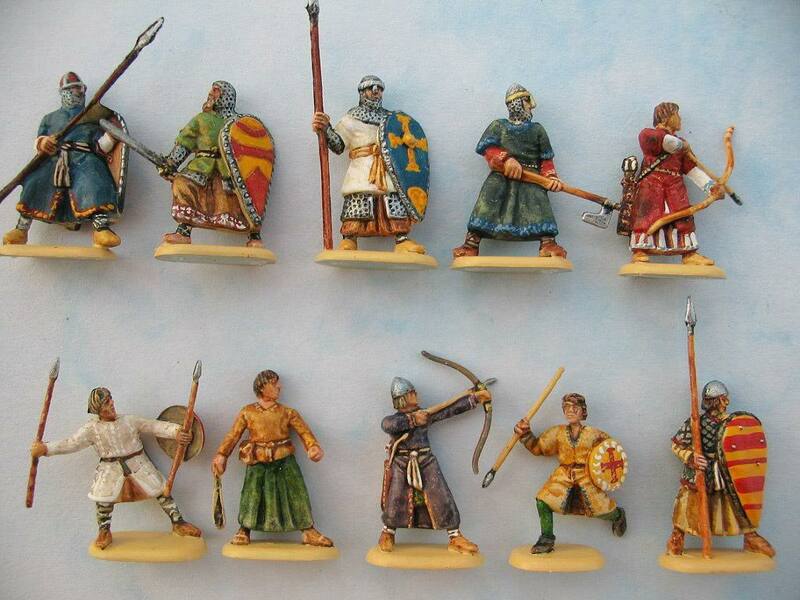 Being also one of the nicest Medieval sets around, this is very recommended to make that regional kingdom that no brand has the guts to bring into the market. Even two or three of the light infantry (specially the swordsman with round shield) could be very nicely used to represent any Barbarian/Germanic kingdom of the Dark Ages. It is a good set, but a bit too oriented to wargaming. Everything is a bit standard. 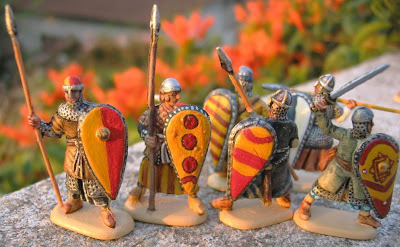 You are given no leaders nor special men, but it is supposed that you have to buy the HaT El Cid Spanish Command to have them. The most fun figures are the two bearded men, which have a lot of character. The Medieval sets that have been made, don't give you many bearded men, and much less warriors passing their 40's, so the bearded man in this set with the mail coat clearly being in his 50s is a great addition. We are talking about pure wargaming here. They have very wargaming dimensions, you don't have to glue nor attach anything, nothing breaks easily, everybody has big bases, you get a perfect balance between the different types of troops, etc. The choice of 96 figures given is also a clear reference to their wargamingness. The only but, is that you need to buy the El Cid Command, as they are absolutely needed to complement this set, as it will give you a musician, flagbearer, commanders, healers, etc. 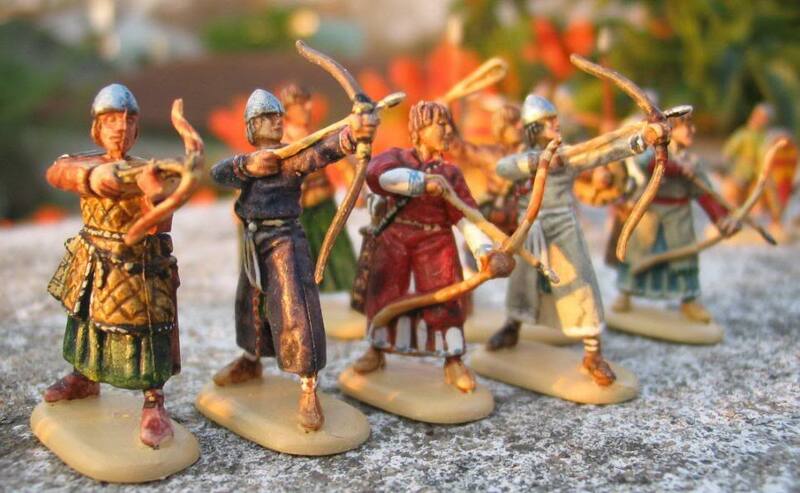 "The price value ratio of this soldiers will vary between any shops you go to, and the best I can do is judge by their average price on eBay"
Is surprising in our days to have such a big number of figures given for a very reasonable price of 12 GBP shipped roughly. In retail stores it is usually more expensive, retailers seeing that they are giving too much for too little! Some people who are not into wargaming, or just not happy wargaming with 48 figures or less, will perhaps find no use in 96 figures, and will find it too expensive. But with the possibilities of cutting them into different Spanish or medieval kingdoms, I find that 96 at this price is the best choice. This is the new plastic HaT is using. It is sort of rubbery, it glues well, and is great for painting, as it is not slippery. The only bad thing is that it is not fully elastic, and if you bend a weapon too much it will just break more easily than a more elastic plastic like Zvezda uses. One of the (if not the) best miniatures HäT has produced, filling a huge gap in history. 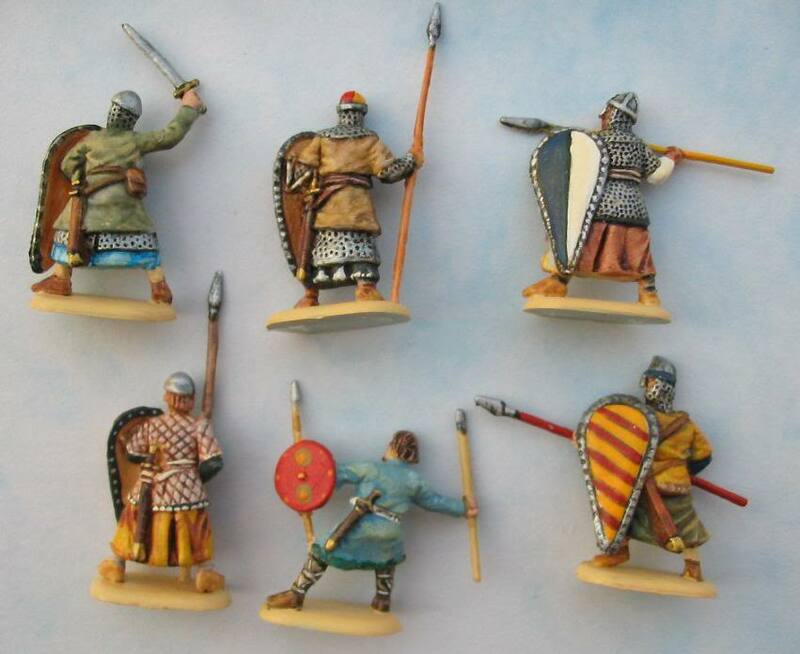 Where before you had to buy French and English and modify them a bit, now this set will fill not just the intended Spanish kingdoms, but also many others. 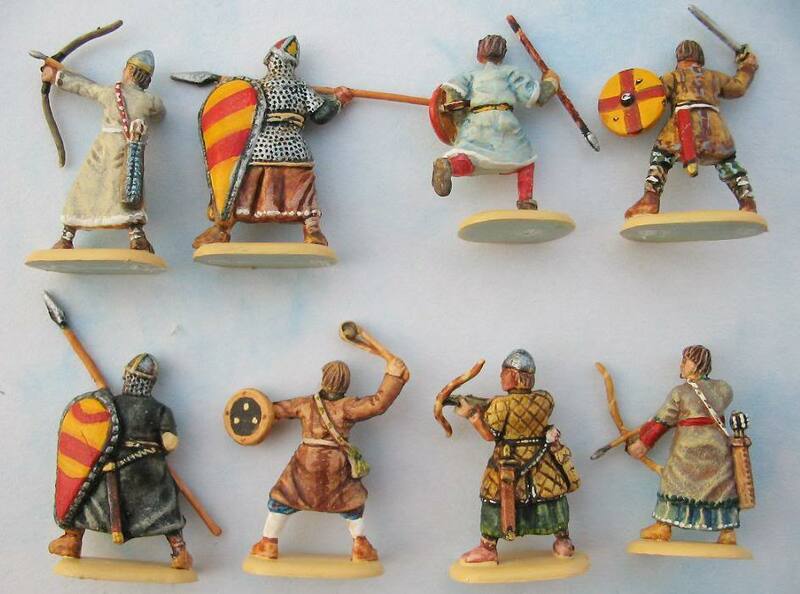 The reasonable price just adds more to this set that has to be a must for any Medieval collector. 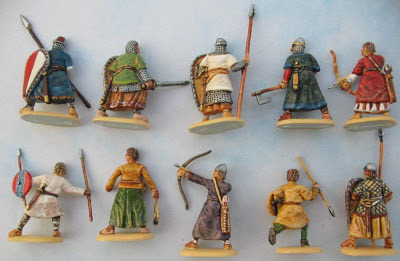 Thanks to Miniaturas Aconcagua (http://miniaturasaconcagua.blogspot.com/) for giving permission to show his awesomely painted figures.